A Guardian article today describes an incident which occurred earlier in the year which, if accurate, would indicate that Greek border guards and possibly border guards operating under Frontex Joint Operation Poseidon Land have returned Syrian asylum seekers (and migrants of other nationalities) to Turkish territory without registering and screening the migrants. At another level, the European Union (EU) engages directly with countries in North and West Africa on migration control, using political dialogue and a variety of mechanisms and financial instruments. For example in 2010, the European Commission agreed a cooperation agenda on migration with Libya, which was suspended when conflict erupted in 2011. Since the end of the conflict, however, dialogue between the EU and Libya on migration issues has resumed. The European Agency for the Management of Operational Co-operation at the External Borders of the Member States of the EU (known as FRONTEX) also operates outside European territory. 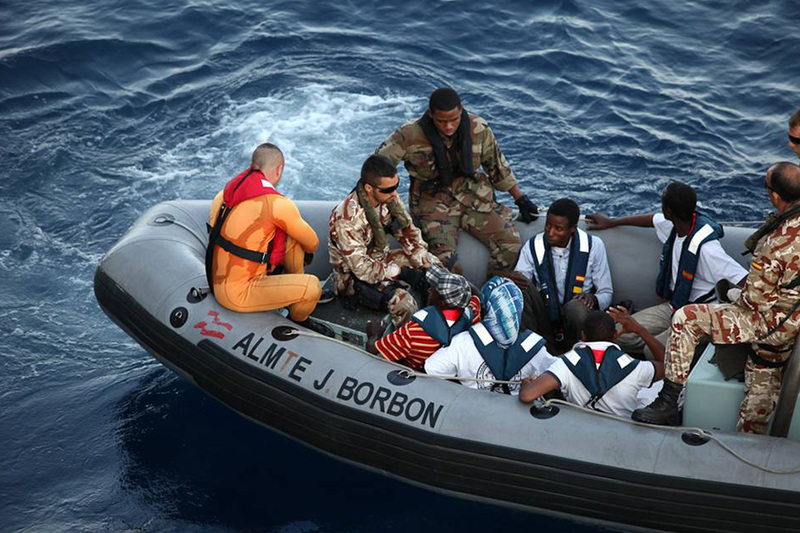 FRONTEX undertakes sea patrols beyond European waters in the Mediterranean Sea, and off West African coasts, including in the territorial waters of Senegal and Mauritania, where patrols are carried out in cooperation with the authorities of those countries. The policy of externalization of border control activities has been controversial. Critics have accused the EU and some of its member states of entering into agreements or engaging in initiatives that place the rights of migrants, refugees and asylum-seekers at risk. A lack of transparency around the various agreements and activities has fuelled criticism. This report examines some of the human rights consequences for migrants, refugees and asylum seekers that have occurred in the context of Italy’s migration agreements with Libya. It also raises concerns about serious failures in relation to rescue-at-sea operations, which require further investigation. The report is produced as part of wider work by Amnesty International to examine the human rights impacts of European externalization policies and practices. The implementation of the agreements between Libya and Italy was suspended in practice during the first months of the conflict in Libya, although the agreements themselves were not set aside. While the armed conflict was still raging in Libya, Italy signed a memorandum of understanding with the Libyan National Transitional Council in which the two parties confirmed their commitment to co-operate in the area of irregular migration including through “the repatriation of immigrants in an irregular situation.”8 In spite of representations by Amnesty International and others on the current level of human rights abuses, on 3 April 2012 Italy signed another agreement with Libya to “curtail the flow of migrants”.9 The agreement has not been made public. A press release announced the agreement, but did not include any details on the measures that have been agreed, or anything to suggest that the present dire human rights predicament confronting migrants, refugees and asylum-seekers in Libya will be addressed. Human rights and refugee law requires all states to respect and protect the rights of people within their jurisdiction: this includes people within the state’s territorial waters, and also includes a range of different contexts where individuals may be deemed to be within a certain state’s jurisdiction. States must also ensure that they do not enter into agreements – bilaterally or multilaterally – that would result in human rights abuses. This means states should assess all agreements to ensure that they are not based on, or likely to cause or contribute to, human rights violations. In the context of externalization, this raises serious questions about the legitimacy of European involvement – whether at a state-to-state level or through FRONTEX – in operations to intercept boats in the territorial waters of another state, when those intercepted would be at a real risk of human rights abuses. A state cannot deploy its official resources, agents or equipment to implement actions that would constitute or lead to human rights violations, including within the territorial jurisdiction of another state. Agreements between Italy and Libya include measures that result in serious human rights violations. Agreements between other countries in Europe and North and West Africa, and agreements and operations involving the EU and FRONTEX, also need to be examined in terms of their human rights impacts. However, with so little transparency surrounding migration control agreements and practices, scrutiny to date has been limited. Amnesty International urges all states to protect the rights of migrants, refugees and asylum-seekers, according to international standards, This report has focused on Italy. ensure that all migration control agreements negotiated with Libya or any other countries are made public. Click here (EN), here (EN), or here (FR) for Report. Italian Prime Minister Mario Monti traveled to Tripoli on 21 January to meet with the Libyan NTC. Prior to his trip Amnesty International sent Monti a letter urging him to address numerous matters with the Libyans, including the eradication of torture, reforming the criminal justice system, and ratifying the Refugee Convention. 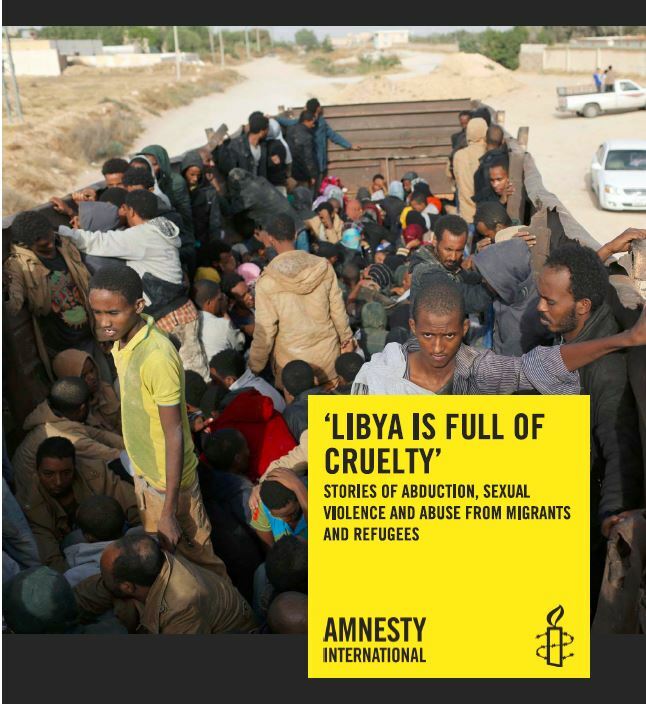 Amnesty also called upon Italy not to resume push-back operations at sea and to refrain from cooperating with Libya on other migration control practices until appropriate reforms are instituted within Libya. There are fears that Italy is moving towards resuming coordination with Libya on immigration control matters. Italian Interior Minister Anne Marie Cancellieri is reportedly scheduled to travel to Tripoli next month to discuss bilateral cooperation on immigration. Click here (EN), here (IT), here (EN), here (IT), and here (IT) for articles. Statewatch released an Analysis by Yasha Maccanico entitled “The EU’s self-interested response to unrest in north Africa: the meaning of treaties and readmission agreements between Italy and north African states.” The Analysis provides a description of Italy’s responses to the migrant arrivals in 2011 caused by the unrest in North Africa. Excerpts: “The ‘crisis’ reveals questionable practices and routine abuses – The measures adopted in response to the increasing number of migrants arriving from north African countries serve to highlight a number of practices that have become commonplace in Italy in recent years. The first of these is a widening of the concept of ‘emergency.’ Calling an emergency gives the government a wider remit to derogate from specified laws so as to resolve situations that cannot be dealt with through ordinary measures…. Although the situation in north Africa was worrying, the emergency was called when slightly over 5,000 migrants had arrived. An analysis by Massimiliano Vrenna and Francesca Biondi Dal Monte for ASGI notes that the government has repeatedly called and extended states of emergency since 2002 to deal with immigration, which is treated as though it were a “natural calamity” even when there is a wholly predictable influx of people from third countries. The urgent need specified in decrees declaring a state of emergency is to conduct ‘activities to counter the exceptional – later referred to as massive – influx of immigrants on Italian territory’ (as happened on 11 December 2002, 7 November 2003, 23 December 2004, 28 October 2005, 16 March 2007, 31 December 2007, 14 February 2008 for Sicily, Calabria and Apulia and was extended to the whole nation on 25 July 2008 and 19 November 2009), stemming from a prime ministerial decree of 20 March 2002. Thus, Vrenna and Biondi Dal Monte’s observation that the emergency is ‘structural’ appears well-founded. It has serious repercussions for the treatment of migrants (see below) and the awarding of contracts outside of normal procedures, with the involvement of the civil protection department whose competencies have been expanding considerably. The second practice involves the expulsion, refoulement or deportation of migrants outside the limits and procedures established by legislation for this purpose. The failure to identify people, to issue formal decisions on an individual basis to refuse them entry or expel them, or to give them the opportunity to apply for asylum or other forms of protection, was a key concern when boats were intercepted at sea and either the vessels or their passengers were taken back to Libya between May and September 2009, when 1,329 people were returned. These rights were also denied to people arriving from Egypt and Tunisia in application of readmission agreements in the framework of the fight against illegal migration. Their presumed nationality was deemed sufficient to enact expulsions to these countries, because ongoing cooperation and good relations with Italy appeared sufficient to indicate that they were not in need of protection, regardless of the situation in their home countries. …. According to information provided by the Spanish Ministry of Defence, the Spanish frigate Almirante Juan de Borbón sailed to Tunisia earlier this morning (16 July) and, while remaining outside Tunisian waters near Zarzis, transferred the remaining 106 rescued migrants to the Carthage, a Tunisian naval vessel. 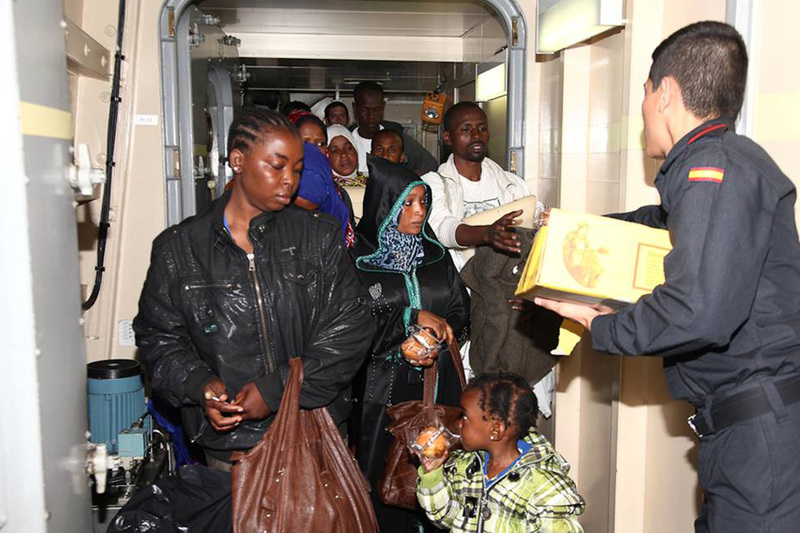 114 migrants were initially rescued by the Spanish ship. 5 of the migrants were airlifted to Malta for medical reasons on 13 July. 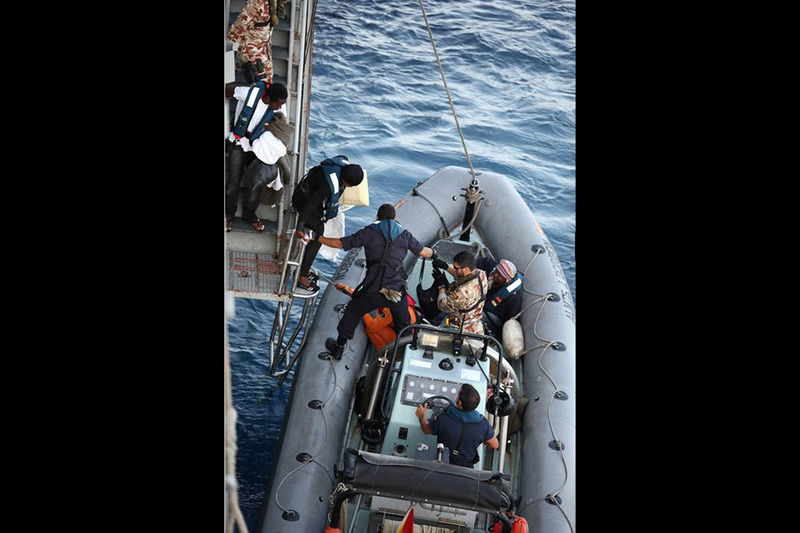 On 11 July, shortly after the initial rescue of the migrant boat, 3 migrants were evacuated and turned over to Tunisian authorities. The original 114 consisted of 88 men, 20 women (5 of whom are pregnant), and 6 children. 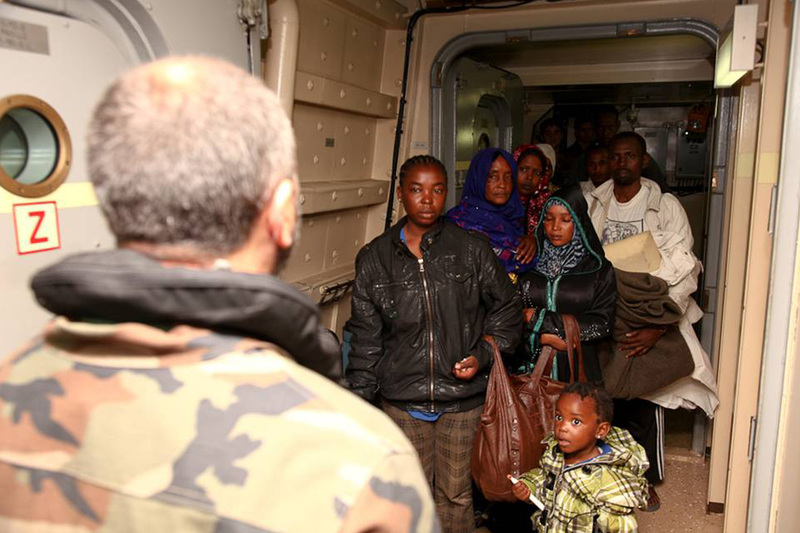 The Defence Ministry said that the decision to transfer the migrants to Tunisian authorities was a NATO decision. While the decision to disembark the migrants in Tunisia is better than sending them to eastern Libya (something I was fearful would occur), Tunisia is problematic for several reasons. The migrant boat was reportedly carrying Tunisians. To the extent that any of them may have had claims for international protection, the claims have been effectively eliminated. It is not known whether any efforts were made to assess whether any of the Tunisians had claims for international protection. And to the extent that any of the non-Tunisians have claims for international protection, Tunisia is clearly less able to handle such claims and less able to provide care for asylum seekers relative to Malta, Italy, or Spain (or any of the NATO countries participating in Operation Unified Protector). Click here (EN), here (ES), and here (ES) for articles.